After seven months freelancing I’m very excited to announce that I’ve resumed the position in the Creative Director’s chair. I talked last October about wanting to search out the new, the innovative and the exciting. At the time I felt I was being ground down by the ordinary. Creating marketing sites for average companies wasn’t, and indeed isn’t, what I wanted to do. I’ve spent the last seven months doing all sorts of things. I’ve written some HTML, done a bit of affiliate marketing, done IA wireframing work for clients, sharpened my knowledge of PPC and a whole host of other things – including some service design. And I’ve loved every minute of it. Over the last couple of months, however, I’ve been spending more and more time with a group of people who are doing some extraordinary things with technology and creative in the digital space. The more time I spent working with them, the more I realised their approach and ideas were very well aligned with how I felt a digital agency should be both structured and run. It was a very comfortable fit for both of us. As such, the approach to take up a permanent position at Made By Many came a few months ago and I’m pleased to announce that I accepted at the end of last month. It’s a very big position and what I hope will turn out be a tremendously exciting opportunity. I’m already ensconced and working on a whole suite of services in the youth volunteering sector. But more on that at another time. In the future, you’ll be able to see me blogging over on www.madebymany.co.uk though I’ll still pop up here from time to time. I’ve had a few days to reflect on my experiences at this years Future of Web Design conference here in London. This is the third or fourth year I’ve attended but unless some things change very drastically I won’t be dishing out upwards of £220 to go again. Historically, I’ve always felt that the conference never gave any answers to the question its name poses. But, as I’ve blogged before, it didn’t really matter because there were often very useful and insightful presentations from very talented practitioners and speakers. That was enough to keep me going back wanting more year after year. This time round, however, I didn’t feel that I got anything of true substance out of the conference. With a few notable exceptions the presentations lacked any depth or insight and on a couple of occasions the future of web design turned into a history lesson with a couple of (well known and respected) speakers delivering retrospectives on their work from the last decade. Not good enough. We attend these conferences to hear some gems of insight into what these guys and girls, who are supposedly at the top of their game, think the future will hold or at least what direction it’s heading. I’m not talking about crystal ball gazing, but a few ideas about emerging trends would slake the audience’s thirst which is derived from the very title of the conference. In a whole eight hours of presentations not one person mentioned ideas around designing sites and services from APIs and open data. Nothing about designing for UGC. Nothing about service or utility design. Nothing about designing apps for the Air of Silverlight platform. These challenges are the future of web design. This is what’s happening out there in the wild but it seems that the very conference whose job it is to address these issues is failing. There was one presentation about designing on projects using agile methodologies which didn’t get nearly enough stage time and was levered into a dead space early on in the conference. Too many of the presentations seemed very lightweight with little substance or evidence. Having said all that, there were a couple of notable exceptions – presentations which exhibited a great deal of preparation on the part of the speaker. Mark Boulton‘s talk on web typography was knowledgeable, insightful and he showed feeling, passion and opinion towards his subject matter. Molly Holzschlag, similarly, displayed great passion about web standards, but did drift towards web development. And Robin Christopherson gave a superb demonstration of the frustrations of browsing the web with a screen reader. But these were scant compensation for the failings of the rest of the conference. And judging by my Twitter search stream at the time (#FOWD) and retweets of my own comments, there were genuine pockets of disappointment around the room throughout the day. How to mend this broken conference? Well, better briefing of the speakers would help. Allowing them to present a re-hashed agency creds. presentation is lamentable. And, if you get a print designer to talk to a room full of digital folk they better have something really interesting to say and not just hide behind some nicely designed slides. If this conference is to work long-term then I feel they should get the direction right or change the name. The web is a tremendously exciting place to be working at the moment with an incredibly exciting future. We have the conference to celebrate this. What we seem to be lacking are the speakers. Just returned from a very nice lunch at Hummus Bros. on Wardour street, Soho. The food was great as always, but it was the attention to their customers that really showed on this visit (I usually get take away). I was eating with two work colleagues and, being the gannet that I am, I finished first so was sat chatting and waiting while they finished. On seeing this, one of the waiting staff brought me over a complimentary glass of mint tea. And when my friends had finished they each got a glass too so as not to feel left out. The cost of doing this is negligible. But it shows a great commitment to quality customer service and left me feeling as though they valued my custom. As Apple’s Steve Jobs says, it’s about the total end-to-end experience. Having a great product that people want is one thing but making it a great experience to buy the product, use the product and a pleasurable follow-up service is what makes companies stand out. And in this market, coupled with the highly competitive landscape of central Soho at lunch, Hummus Bros. deserve to do well. I’m convinced. Where do I sign? Back in the 1980s, to help himself decide whether what he was producing was good design, Dieter Rams drew up what has come to be known as his 10 Commandments. Read the full list on vitsoe.com. His work still looks fresh many years later and is often held up as inspiration for the current aesthetic of Apple product design. 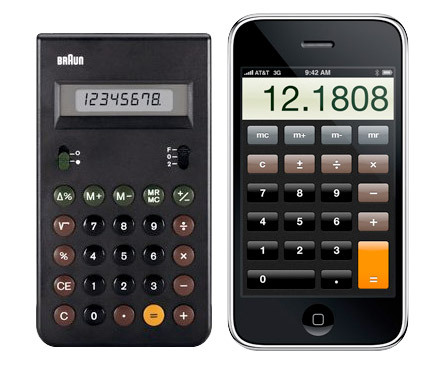 You only need to look at his Braun calculator alongside the iPhone calculator or the punched aluminium casing of the Mac Pro alongside his T1000 Braun radio to see how his clarity of design thinking has endured long after the fads of a moment have been confined to the land fill. 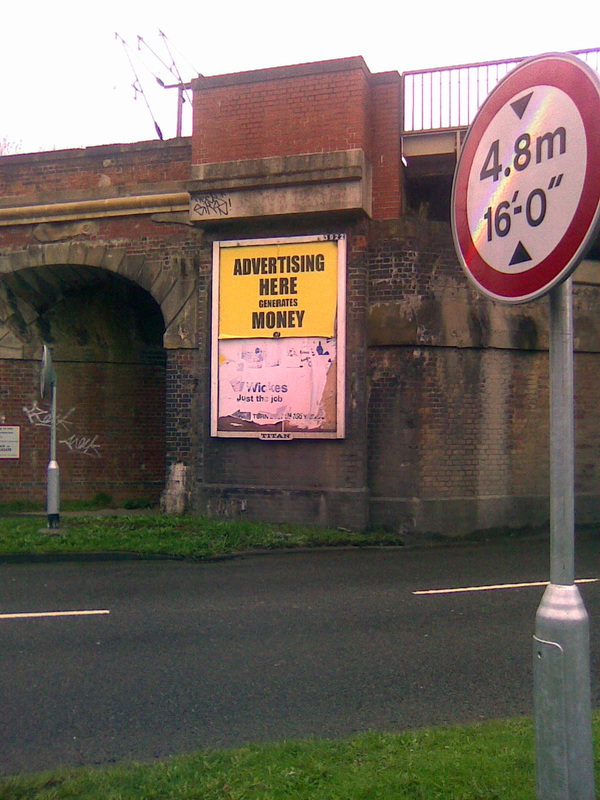 Do it, then fix it is a blog post from ad guru Dave Trott. In it he comments on something I agree with wholeheartedly. Why sit around talking about something when you can just get on an do it? One of the analogies he uses is from the film set. I’m subscribed to his blog and I can recommend it. Even though every post is written like an ad end line. Ever been doing a piece of work and needed a beautiful ampersand? Well, The Mesmerizing Curves of Ampersands is a great resource for helping to find the right one for the job. With links to download and buy – some of them are even free. Courtesy of James Higgs, Layers is a great little tool which captures your display in a layered Photoshop file. Think Cmd+Shift+4 on steroids. Grappling with some difficult interface design? ecommr may provide the answer through its extensive gallery of interface design elements. Want to know how social media tool du jour Twitter came into being? Well now you know. The Art of the Title Sequence is a collection of some of the most beautiful movie title sequences. The Directory is a list of design studios, individuals, blogs, shops, photographers, resources etc. May take some time to go through that lot. If I find anything of particular interest I’ll post it here next month. A site that I was working on just before Christmas with the good folk over at Made by Many has recently gone live. 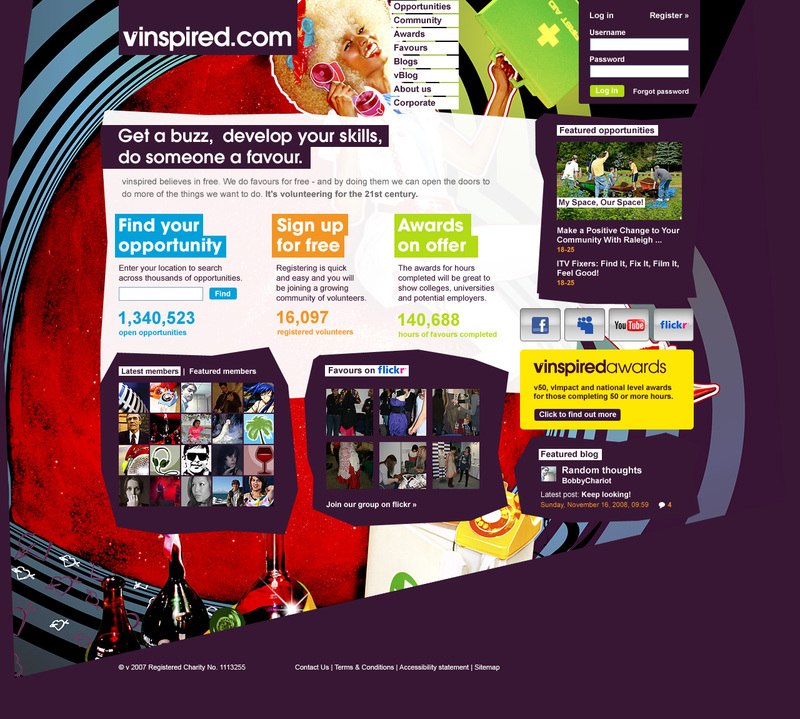 vinspired.com is all about volunteering. They believe in free. They do favours for free – and by doing them they look to open doors of opportunity. Run by ‘v‘ which was set up in 2006 by The Russell Commission and supported by the office of the third sector, they are working to get more 16-25 year olds volunteering. They organise events up and down the country and provide opportunities for the target audience to increase their own skills while at the same time helping others. It’s a really great organisation with lots of life and energy. As far as the site is concerned it was a simple reskin and tidy up of what went before. I’ve made it look more energetic and edgy and the architecture and usability have been reworked too. We really wanted to make it feel like there was a community of people all participating in activities and sharing experiences. There’s more to come in the coming months. Go and check out vinspired.com.